Security at Britain's parliament was under review on Thursday after a terror attack in the shadow of Big Ben but lawmakers spoke proudly of a remarkably open policy for public access as part of democracy. Prime Minister Theresa May hailed the response to Wednesday's attack in which an assailant was shot dead after running down pedestrians on a bridge and then stabbing a policeman just inside an entrance to parliament. But some lawmakers and commentators have questioned how, when the national terror threat is high, the attacker managed to get through the security gates. "Obviously the security arrangements of the (House of) Commons will now be reviewed to see whether that is completely adequate," Defence Minister Michael Fallon told parliament. But he told Sky News: "Parliament can't be hermetically sealed. People come in and out all the time. We have visitors, quite rightly, we are the home of democracy." 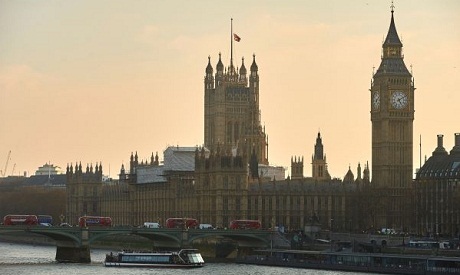 British residents can visit parliament by appointment or on tours or to spectate during the weekly prime minister's questions time on Wednesdays. Commons deputy speaker Lindsay Hoyle told the BBC that a security committee would hold an emergency meeting on "what else needs to be put in place", but his office could not provide further details. Unlike most police in Britain, many officers guarding parliament do carry guns, although not all of them. Keith Palmer, the policeman killed on Wednesday, was unarmed. London police announced plans last year to train another 600 armed officers, taking the total number to 2,800, following the Paris attacks. The total number of police in London is around 31,000. Former minister Theresa Villiers asked whether it was now time to routinely arm police "who guard sensitive sites known to be of interest to terrorists, such as parliament or airports". May responded that this was an "operational matter for police" -- but noted that security had been increased significantly since she first entered parliament two decades ago. "We should be clear first of all that an attacker attempted to break into parliament and was shot dead within 20 yards of the gates," the prime minister told MPs. "If his intention was to gain access to this building, we should be clear that he did not succeed. The police heroically did their job." Any review would likely focus on Carriage Gates, the vehicle access gate through which the assailant reportedly entered parliament grounds -- and which is often left unlocked as cars go in and out. Public roads run alongside two sides of the parliamentary estate, and although barriers have been put alongside some of them, there are gaps. Members of the public queue up each day to watch proceedings in the Houses of Commons and Lords from the public gallery, passing through airport-style security before going in. Since 2004, there has been a glass screen in front of the Commons gallery to stop people throwing things onto MPs below. That measure however did not prevent condoms full of purple flour being hurled at then prime minister Tony Blair. The galleries were open as usual on Thursday, while visitors could also be seen walking around the estate, even as forensic officers continued their work in the grounds. "In an open and free democracy such as ours there will always be a balance between our security, and public access to and the transparency of our democracy," Conservative lawmaker Andrew Bridgen said. "In an open and free democracy such as ours there will always be a balance between our security, and public access to and the transparency of our democracy," he told parliament. "And that if that balance is not maintained, unfortunately, the terrorists will have won."